As the fastest-growing population group in the country, Asian Americans continue to expand their footprint and create significant impact on every consumer category. Over the last decade, the influx of immigrants of various Asian nationalities has led to an overall increase of Asian American population by 25%. Today, there are 20.5 million Asian Americans, which represents about 6% of the total U.S. population. According to the U.S. Census Bureau, this number will reach 25.7 million by 2019. The same study also projects that by 2055, the Asian Americans population will outnumber Hispanics as the largest immigrant group. 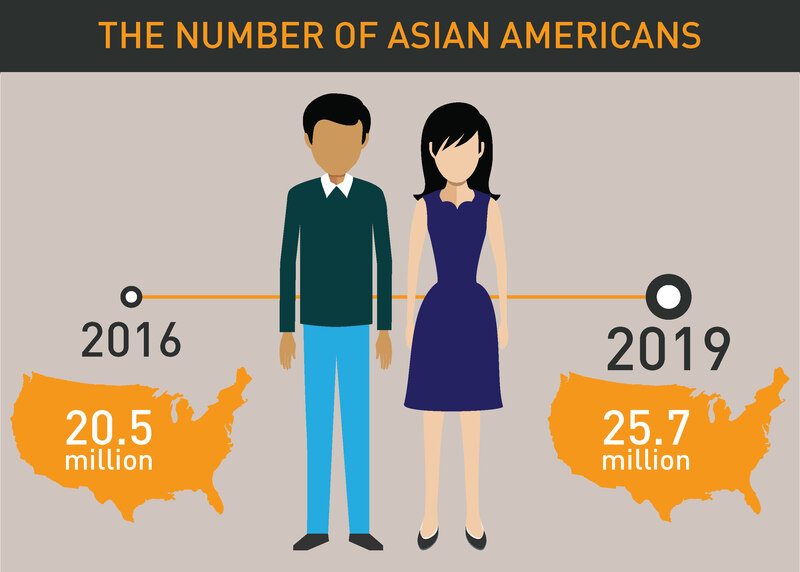 With such a growth trend, Asian Americans should be the centerpiece of any marketer’s growth strategy. What do we need to know about the Asian American consumer? Asian Americans are considered one of the most diverse racial groups. Among more than 40 nationalities, Chinese are the largest group, which represents 20% of the Asian American population. It is followed by South-Asian Indians (17%), Filipinos (16%), Vietnamese (9%), Koreans (9%), and Japanese (6%). According to US Census Bureau, 69% of the Asian Americans reside in 16 metropolitan cities, with New York and Los Angeles as the two most popular destinations for recent immigrants. The focus on education is likely one of the biggest drivers of Asian American wealth. In 2015, about 59% Asians had a college degree, compared to about 38% of the overall population. The investment in education seems to be a unifying theme across Asian American consumer groups. Asian Americans are also the wealthiest segment of the U.S. population on a per-household basis. With a household median income of $74,245, the median Asian American household income is 38% greater than the national median income of $53,889. According to the Selig Center for Economic Growth at the University of Georgia, they currently have an estimated buying power of $825 billion. It is expected to grow to $1.1 trillion (6.7% of total U.S. buying power) in 2020. Asian Americans represent one of the fastest-growing, highest-income, and most-educated population segments in the U.S. As a result, this consumer group should be the centerpiece of any marketer’s growth strategy. In the following, we will list out the top categories that Asian Americans over-index on, and explore the reasons behind such consumer behaviors. Food is key for cultural bonding in the Asian-American community. The group also views healthy food consumption as the primary pathway to health and beauty. As a result, this group significantly over-indexes on the purchase of fresh fruits and vegetables, seafood, baked goods, Prepared foods, coffee and other fresh items. Asian Americans purchase 69% more fresh seafood than the total population. Asian Americans over-index the general population for buying baby products, with a 70% higher rate in the baby needs category and 30% higher in the disposable diapers category. When asked if they plan to have a baby in the next 12 months, Asian- American respondents said “yes” at a 57% higher rate than the total population. Asian Americans tend to have an appetite for the best and the latest electronic goods. Recognized as early adopters, they gravitate toward the most innovative products, often acting as trendsetters in the category. While its electronic device ownership is strong in all regions, the segment group outpaces the general market in the South, where they own 10% more smartphones, 18% more home computers, and 22% more tablets than the general population. Asian American women have the highest smartphone penetration of any racial or ethnic group in the U.S.
70% of Asian American consumers use smartphones (highest usage among any other segment groups) to browse daily news, interact with friends through mobile messaging apps, and even frequently make personal purchases through mobile applications. According to Euromonitor, Asian consumers remain the vital driver for the growth of international luxury brands through 2019. While Chinese shoppers account for 31% of the $273 billion global personal luxury goods market, the US is the biggest market outside of Asia. 39% of Asian American women are entrepreneurs, and 46% say their goal is to make it to the top of their profession. More importantly, 76% of Asian American women will pay for a brand they trust, even if it is slightly more expensive. When it comes to spending, they’re not afraid to demand brands and products that support and speak to their values or personal goals. Asian Americans are 43% more likely than the general population to travel abroad. About 57% of Asian Americans have taken a trip outside the continental United States during the past three years and are 46% more likely to have traveled in first class on foreign trips. The consumer group also significantly over-indexes on the automobile industry. They spend on average $2252 annually, while the total population spends only about $1956. About 23% of Asian Americans bought cars priced over $30,000, compared to 19% of the general population. That higher price point is reflected in the vehicle features that they prefer. Asian Americans were 13% more likely to pick “luxury and style” and “green and trendy” as the description of their ideal. 29% of Asian Americans own individual stocks, compared with 23% of the general population. Asian Americans strive for the ultimate form of security – homeownership. As a result, the segment group has higher ownership rates than most ethnicities. With higher median home values, Asian Americans are likely to spend more on their mortgage. As a result, financial centers should look to market their mortgage products. In the East and West where the majority of them reside, Asian Americans tend to have higher mortgage balances (7% have mortgage balances of $500,000 or more, versus less than 1% of the general population). Conclusion: How to harness the buying power of Asian American consumers? If Asian Americans were a country, their spending would represent the eighteenth largest economy in the world. However, marketers remain hesitant to include Asian American consumers in their multicultural marketing efforts. This is likely due to the diversity of the segment population, which is made up of different nationalities, languages, heritage and traditions. ‘Ethnicities like the Hispanic and African-American population share only one language so it’s easier for marketers to come up with a more universal message. As a result, sometimes it becomes convenient to only consider Asian-American consumer group when there’s leftover in the budget,’ says Jeannie Yuen, CEO of APartnership, a New York-based multicultural ad agency that focuses on Asian-American consumers. Nielsen, Scarborough Research, USA+; 2013 Release 1.